They weren’t kidding when they titled this “Torrential Rainstorm.” When you finish listening and you realize that you are safely on dry land, you’ll kiss the ground and thank God you’re still alive. Howling winds and sheets of falling water characterize this exhilarating listening experience. While most sane people would be evacuating or battening down the hatches, the producers of this project were apparently setting up their recording equipment. You might be able to use this as a sleep aid, but only if you are the type who can sleep through a hurricane. 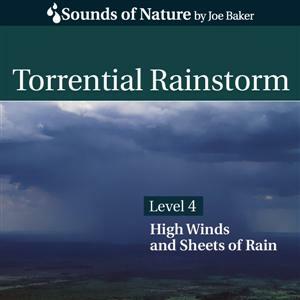 This recording is the fourth (Level 4 Intensity) in the “Sounds of Nature” series on rain sounds put out by producer Joe Baker. If you want gentle rain sounds, buy their Level 1 or Level 2 recording. If you want to recreate what the folks in “The Perfect Storm” were experiencing, then buy this recording. The audio quality is superb, making the experience more enjoyable or disturbing according to your listening preferences.